It didn’t cool down very much last night. This morning was pretty overcast but by noon it had cleared off the sun was out in full force. We decided to do an early bike ride. We chose one recommended by the lady at the Visitor’s Center. 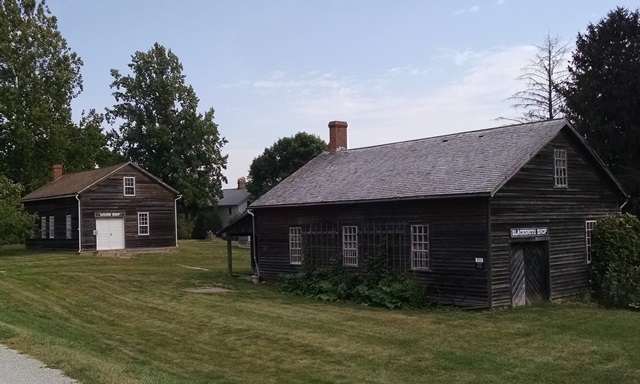 The Amana Colonies Gravel Bike Trail begins from the paved trail over to Middle Amana but then turned out through a residential area on the streets. It continued on streets out of town until the road became a gravel road. We had been told this was a gravel trail. In actuality, it was a gravel road and remained so all the way to West Amana. Fortunately there was very little traffic – just a few cars and tractors. Shortly after becoming gravel there was a split. To the left was the road to High Amana and the right, to West Amana. The trail to West Amana was listed as 17 miles round trip. We thought we would enjoy doing that trail, so to the right we went. It was listed as a difficult trail. It was correct. There were two nasty hills to climb. However, the most difficult aspect of the ride to us was the gravel. We have biked gravel trails before that were great. These roads were very rough. In some areas the loose stone was pretty treacherous. The road was very dusty and this tractor pulling a manure spreader passed us three times. We continued on to West Amana. 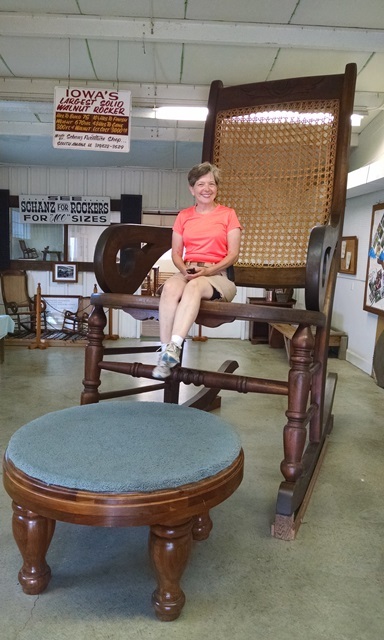 There we stopped at the Broom and Basket Shop and saw the largest walnut rocking chair in Iowa. It was pretty impressive. 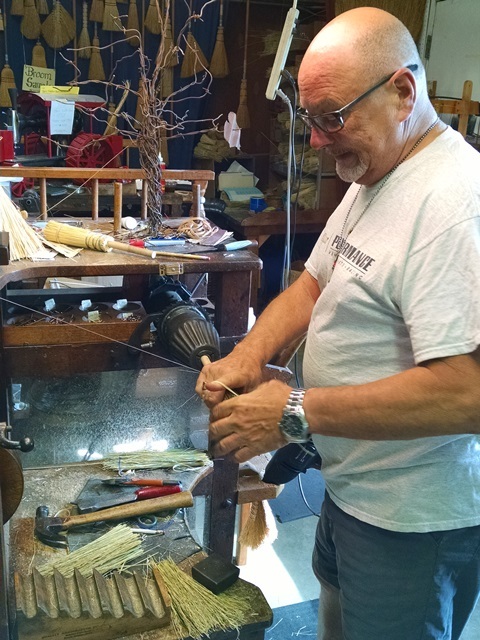 We also watched a gentleman making brooms. Today was the apple festival so businesses were giving free samples of things apple related. The Broom and Basket Shop had mini fried apple pies. There were very good. We then had to start the ride back. It took us longer to get home than to West Amana. We also discovered the seventeen miles round trip was the gravel portion only. It did not include the paved trail and roads you took to get to the gravel roads. 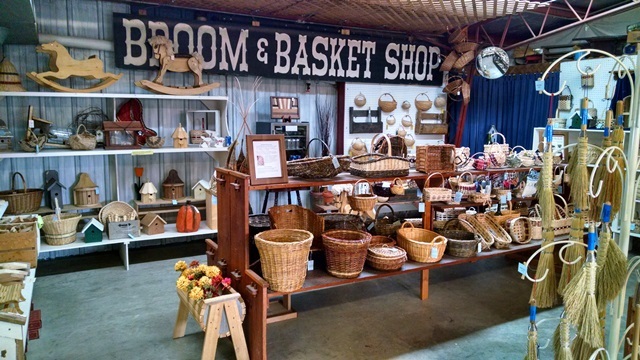 … home of Iowa’s largest walnut rocking chair. It was interesting to watch how brooms are made. So, we biked a total of 23 miles today. We were tired and hungry. After a quick lunch we drove into town for the Amana Colonies Apfelfest (apple festival). There were all things apple to try. Apple cider, caramel apple fudge, apple cake, apple tea, apple coffee, on and on. Surpisingly, there were no apples to purchase. We were expecting to be able to buy some good local apples. Nope, none to be had. We were disappointed. The brochure told us what samples were at each shop. The town was very welcoming to us. One of the looms in the Woolen Mill. On weekdays you can watch the looms work. Returning to the camp ground we found that several dear friends had arrived. So we visited until time to get ready to go to the Old Creamery Theater. 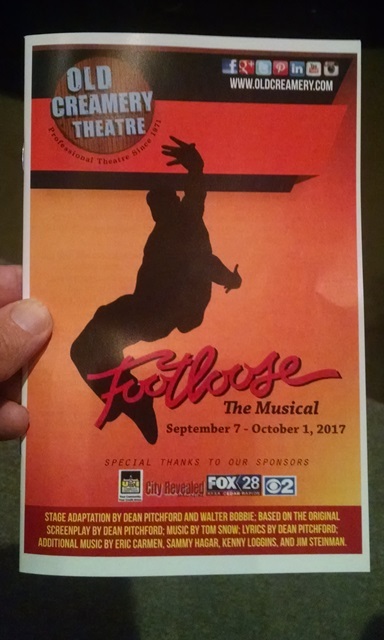 The production tonight was the musical Footloose. We especially wanted to see the play after our Disaster Rebuild project in Elmore City, OK where the event happened on which the story was based. (Click here to read our blog entry from Elmore City.) The play was excellent!! We had such a good time. Now we are home and all the exercise today has caught up with us. We are really tired and now going to bed. Good night. 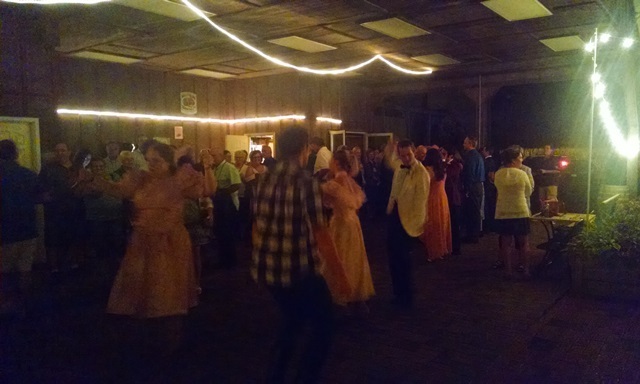 The audience was invited to an after show dance. Wow that was quite a day. Not my idea of a good bike trail. A fun day! When we went through Washington where all the orchards were, mile after mile, we thought there would be some stands to buy apples but didn’t see any.